Offers:Up to £340 off selected dates. This family holiday to China is a 14 day introduction to this vast and fascinating country that suits children aged five and upwards. 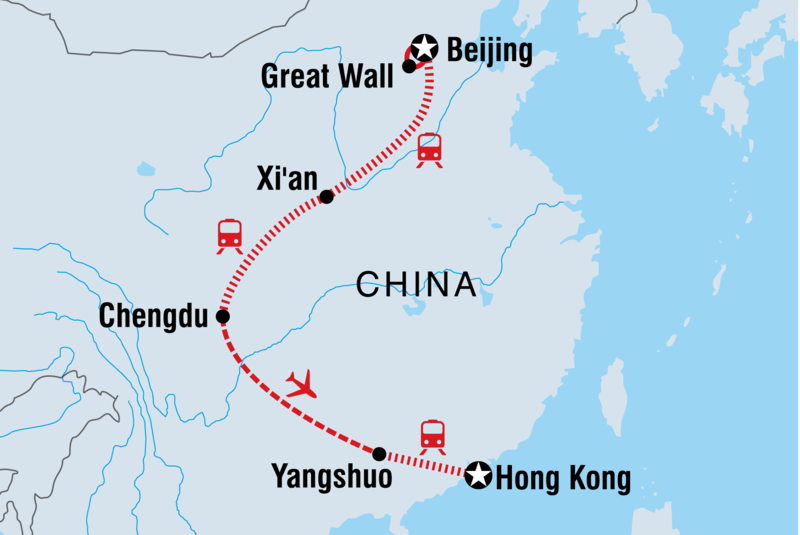 Experience the colour, culture and natural beauty of China, visiting its world famous landmarks, shopping in local markets, spotting wildlife and learning how to cook Chinese food before winding up the holiday in Hong Kong, where old and new, East and West collide. The holiday begins in Beijing. Here, you’ll explore the Forbidden City and Temple of Heaven, but also get a feel for modern China as you soak up the city’s atmosphere and people watch on its busy streets. From here, head to the Great Wall of China, climbing this extraordinary wonder and learning all about its history, too. You’ll explore the ancient city of Xian on foot then cycle its city walls and, of course, feast your eyes on the Terraccotta Warriors, lined up and ready for battle. In Chengdu, meet the pandas nurtured at the panda research centre. You can watch them playing – ridiculously cute! – see red pandas and learn about conservation work. Then relax in Yangshuo, a peaceful town surrounded by a gorgeous landscape of karst peaks, where you can bike, take a kung fu or tai chi lesson, visit a farmer’s market and enjoy a cooking class. Throughout this family holiday you’ll have the chance to meet China’s friendly people, too, with an overnight sleeper train an exciting way to spend time with locals and learn about Chinese culture, while racing through the landscape. This is a small group holiday, max 16 people, with hotel accommodation and one night on a sleeper train. As adventure travellers we relish and celebrate the diversity of the world. We also recognise our obligation to protect the environments that we explore. Our aim is to tread lightly, whilst contributing to maintain the world’s culture and nature, and most importantly to engage the help of all our customers to utilise the potential of tourism as a tool to aid sustainable development. We believe that responsible travellers are welcome in the places that they visit. We stay in small locally-run hotels and eat in local restaurants. We use a local Chinese agent, driver and a Local Group Leader. This fulfils part of our commitment to make a positive contribution to the local economy and is the best way of ensuring that our money reaches as many people as possible. Local overseas leaders offer a great way to find out more about the local culture, speak the language, understand the day-to-day life around them and help to ‘open doors’ to a fuller experience. The Local Group Leaders have a set of environmental guidelines that they work with and will share this information with you during your trip. Being Responsible is at the heart of everything our company does - full details of our code can be found on our website. The local supplier for this trip will promote our responsible travel code throughout your adventure. You will also receive specific information on this trip’s responsibility in your trip notes. We have a foundation that collects the funds that you donate to us to support our projects. All our customers are invited to make a £1 per person contribution to the foundation at the time of booking. We will match every contribution that you make with our own £1. You as a customer choose where these funds are used from a shortlist of nominated projects – so it really is YOUR foundation. As a company we support The Travel Foundation, a UK charity that has been established to promote responsible travel practices throughout the whole of the travel industry. We also work with a number of charity partners who work in the destinations that we visit; including Friends of Conservation and Born Free Foundation. We partner with many small grassroots projects throughout the destinations that we visit - they all share our responsible vision. fishing. Cooking school and Tai Chi were fun. demonstration - a chance to see something thrilling and unique with the added bonus of water buffalo wallowing in the river. Yes, local people - guiding, trips and activities were run by local individuals. tour are in big cities. It would also be good if the river trip and cormorant fishing were built in to future tours as this is a unique feature of the Guilin area.